Home / UncategorizedCreating a Focal Point in Interior Design!! Creating a Focal Point in Interior Design!! The focal point is one of the most fundamental elements in interior design. It’s the first place viewers’ eyes should land when they enter the room and it’s the emphasis point around which you build the rest of your design. With that in mind, it’s important to make sure you’ve chosen the right spot for this showcase. Here are few points to consider in creating focal point. Windows and outdoor views: Views — especially eye-catching ones — are an easy choice for a focal point. Regardless of what else is in the room, eyes naturally travel there. If you have this type of view, all you need to do is allow the windows to be as big as possible. Vaulted ceilings: While vaulted ceilings don’t seem like they require much in terms of design, it’s important to make sure they stay freshly painted and include a bold light fixture. 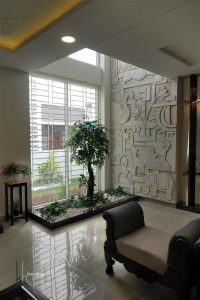 Interestingly angled walls: Consider making this wall as a focal point by creating an accent wall or, if applicable, playing up a feature likes a window seat. Other times, there aren’t any built-in features to emphasize and it’s necessary to create one of your own. While this does take a little bit more effort up front, it’s far from impossible. Again, there are plenty of options to choose from, so feel free to pick the one that works best for you. Accent walls: Accent walls have always been a popular option for a focal point. Typically, if there are no built-in features to work with, an accent wall can be created on the furthest wall from the entry into the room. Be sure to use a bold paint color or patterned wallpaper to draw attention. Artwork: A statement piece of artwork or mirror can carry a room by itself. In this case, you’ll want to make sure the piece you choose is big enough to suit the wall it’s placed on. It should be placed at eye-level and, whenever possible, you should add accent lighting to highlight the piece even further. Backsplashes:Kitchens and bathrooms tend to have their own standards for focal points. Usually, a tile backsplash — either in the shower or behind the stove — is the best choice. Again, just make sure it includes a bold color or pattern. Statement furniture: A large, statement piece of furniture can serve as a fine focal point. This is typically the case in dining rooms and bedrooms, where there is obviously a central piece of furniture in the room. Here, you’ll want to add accents like a centerpiece for the table or some throw pillows on the bed to help draw the eye. In addition to knowing how to create a focal point like a pro, it’s important to know what traps to avoid. We’ve outlined some of the most common mistakes that have a tendency to muddle up a cohesive room design. Having more than one focal point: When a room has two separate usage areas — say, for example, a kitchen and eat-in dining area — it can be tempting to create two focal points. However, that can confuse the viewer. Usually, the room should have one central focus, with a secondary if necessary. In that case, the focal point should be part of the primary use. Forgetting to frame the area: Even if your room has a built-in focal point, it’s your job to add extra details to ensure eyes always fall where they’re supposed to. Add extra design elements around your chosen point to draw attention. Leaving out lighting: Every focal point should have its own lighting source to help it stand out. Do you make a point of including focal points in your designs? If so, do you have any tips of your own to add? Share them with us in the comments. ← An elegant home full of style !! Give your entrance hall some ‘WOW’ factor !! What kind of services do interior designer provide?